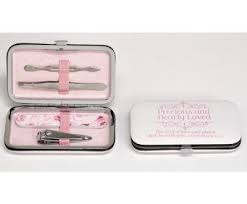 Handy manicure set includes nail clippers, emery board, cuticle pusher, and tweezers. The front of the hinged case features The God of love and peace shall be with you. 2 Corinthians 13:11 Case has a snap closure and elastic holders to keep everything in place. Perfect for travel, office, or home.